Kettlebell workouts combine cardio, strength, and flexibility training for a stronger leaner body. The Kettlebell is said to have originated in ancient Greece and was later on used in the Russian military as part of training. They can weight over 100lbs for a serious workout. Though they might look intimiditaing, they come in various weight levels, and some have adjustable plates to add weight as you progress. 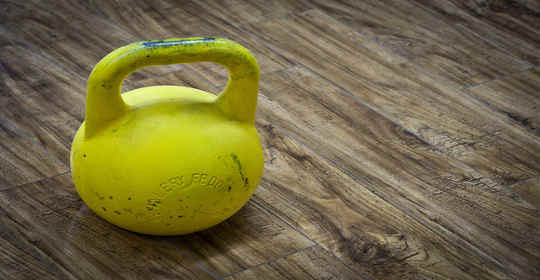 The great thing about kettlebells is that they give you a full body workout, and emphasize in strengthening your core. There are various moves that can be done with kettlebells which target various muscle groups. One of the simplest yet very effective move is the kettlebell swing. 1. Start standing straight with legs apart a bit over shoulder distance. Holding the kettlebell with both hands in front of you just below your waist. 2. Do a soft swing to get the momentum going, and squat down holding the kettlebell in front of you between your legs. Be sure to keep a straight back and your chin up. As you raise up from the squat use your core and legs to swing the kettlebell up at shoulder level. Arms should be straight. 3. Drop back into a squat, and as you go down lower the kettlebell back down in front of you, keeping your arms straight. Repeat the move. Check out this great tutorial for a visual description! I love kettlebell workouts because they’re perfect for adding lean muscle mass. You can feel the workout, especially if you use a heavier weight, and it’s a fun way to get your day going. I recently started Jillian Michaels Shred it with Weights routine, and I have noticed a stronger core and back, with some nice definition adding to my arms. Definitely has become one of my favorite workouts. You’d be surprised at the results one little kettlebell can deliver. In my opinion, it beats the time and money spent at a fully equipped gym. Have you used a kettlebell before? What’s your opinion on these type of workouts? !